Hello, I am an events photographer based in Warrington, Cheshire covering weddings, birthdays and events across the North West. I pride myself on providing a friendly, professional and efficient service. My event photography service covers all types of events, from large corporate events, to small team nights out, from 60th birthday parties, to a child's first birthday party. All my event prices include: Unlimited photos | All the photos supplied at full quality/resolution and are copyright free so no logos or watermarks | A password protected online gallery & slideshow which can be shared with your friends and family. Luxury photo albums are also available in various sizes, styles and finishes. Based in Warrington, covering Manchester, Liverpool, Bolton, Northwich & beyond. 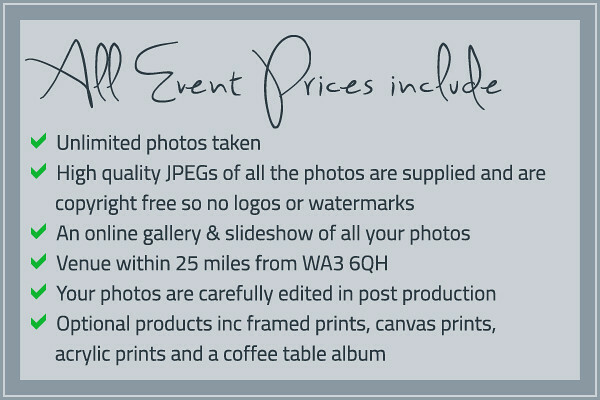 My event photography prices are for locations within 25 miles from Birchwood, Warrington, WA3 6QH. This does include Manchester, Liverpool, Bolton, Stockport, Bury, Rochdale, Wigan, Runcorn & Northwich. I do welcome event photography for any locations further than 25 miles, please do ask me for more information.